There aren't many gifts I enjoy receiving more than Amazon gift cards. If I was rich, I'd probably sit at home all day shopping on there. -I bought vanilla beans on there for an incredible deal (in comparison to grocery stores) to make my homemade vanilla extract. -You can find beeswax on Amazon to make homemade deodorant, homemade solid perfume, and homemade chapstick. -I found this Guittard Dutch Cocoa to make some amazing salted caramel hot chocolate mix. So, if you like shopping on Amazon, you should definitely enter this giveaway! Good luck! I wish I could give you all a $20 Amazon gift card, but there will only be one winner. I will announce the winner at the end of the giveaway, and I will email the winner to let them know that they have won. 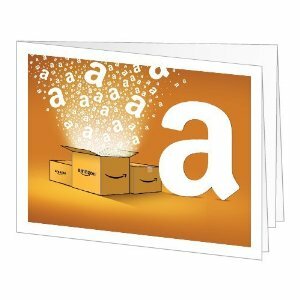 The gift card will be emailed to the winner as well. The winner will be chosen at random. See terms and conditions. I am hosting and sponsoring this giveaway. This giveaway will end on April 15th at 12am and begins tonight (April 8th) at 12am. You know I love Amazon. Thanks for hosting a fun giveaway. I need to do another one, soon!! Ironically, I made a jar of citrus vinegar cleaner a couple of weeks ago! =) Cute blog with great ideas. Oddly, I'd buy training pants or cloth diapers for my 2 y/o who is potty training, but too tiny for the underwear they sell -- amazon.com has some in his size!! New follower on GFC! Love your blog!! There are a couple of books I'd like to buy, not to mention some diy tools (father's day is coming up, although he'd use them on a project for me). Congrats on your success. Would love to win the gift card. Love shopping Amazon! It was a great at Christmas time. Thanks for hosting the giveaway! I'm looking at a book of Native American crafts to share with my grandsons this summer at camp! They have it at Amazon...that's what I would buy. I've been shopping online for about 12 years now, much longer than my adult children have; Amazon is a tried & true site. I love it for hubby & especially for a couple of said children at Christmas time...but I don't believe I've ever bought myself anything from there! I would use your gift certificate toward a book; probably an expensively large & lovely coffee-table style book! You rock!! I'd love to buy a new handheld vacuum. Thank you to everyone who entered and shared what you love to buy on Amazon! Congrats to the winner, Sabz M.! Woo! I didn't get an email :( send it again to theeclecticgrabbag@gmail.com...THANKS!! !